The Straight Set technique is one way that you can construct your ab workout routine. The Straight Set technique is the simplest and most common way to exercise. If you use straight sets, you simply focus on one exercise (doing 2-3 sets) before moving on to the next exercise. On this page there are 6 straight set workouts from beginner to advance. perform each exercise 2-3 times before moving on to the next exercise. If you don't have access to the necessary equipment to perform a certain exercise, choose another ab exercise from the directory. You should aim to work out your abs 2-3 times per week. You can perform each routine for 1-3 weeks to create a 6-18 week workout program. The 2 beginner workout routines consist of 2-3 exercises. The 2 intermediate workout routines have 3-4 exercises. The 2 advanced workout routines have 4-5 exercises. 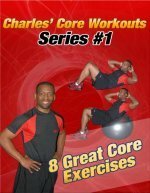 I hope that the above workout routines make sense and help to add structure to your exercise regimen. Pick a routine that suits your current level of fitness and start there. Do the same workout 2-3 times a week for 1-3 weeks and then move on to the next workout. If you can't perform an ab exercise, substitute it for one you can do. or perform a circuit workout for your abs. Have fun and keep working at it!